One Minute Apologist looks at the Bible and the Qur’an – which is the Word of God? Obviously, neither could the Word of God, but because of contradictions, the both can’t be the Word of God. They both can’t be true because they contradict each other. Historically establish that Jesus predicted his violent death and that he died a violent death, then Bible must be correct and not the Qur’an. If he didn’t die a violent death, then the Qur’an would be correct on that point, however it would be wrong on Jesus being a prophet, because Jesus predicted he would die a violent death, but he did not. Catch 22. My comment on this video: I think this argument falls short. Wouldn’t the Qur’an have to contain an account of Jesus predicting his own violent death for there to be a Catch-22. 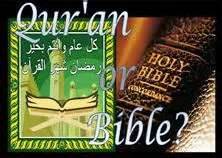 Muslims already say that the Bible has been corrupted, so anything that is a contradiction between the two is erased away under the conclusion that man changed the Bible at some point in time. Of course, it’s a good start to a conversation, because after a Muslim presents the Bible’s been corrupted argument, more in-depth conversation can begin. Not bad for a one-minute video (that was two minutes long).